These sages are plants that have a history of being misidentified with one another. Salvia aethiopis (Mediterranean sage) (WEED RISK!) has been sold as S. argentea (silver sage). Along with S. sclarea (clary sage) and a number of Middle Eastern and Central Asian species, it is a member of section Aethiopis. These sages grow as basal rosettes and are biennials or perennials that frequently die after producing a seed crop (monocarpic) . They are adapted to xeric conditions and like arid, high, cold deserts and mountain meadows. Even in these conditions, most are not weedy, although it will be prudent to test new sages of this type for this behavior. The monocarpic Mediterranean sage, however, is a prolific producer of seed and definitely is a noxious weed, having spread to many states in the Rocky Mountain states. For me in North Carolina, it is not persistent, although I get a few volunteers. It should be safe for all states east of the Mississippi River. Clary sage is being listed as a noxious weed in the state of Washington on the basis of one known persistent population. I know of one other population in Idaho. I believe both populations are in disturbed areas. It certainly has been deliberately planted much more frequently than Mediterranean sage and is a moderate, not a severe risk, in my opinion. I have not heard of silver sage as an escape. In the Denver Botanical Garden, there is a twenty-seven year old specimen that still puts on a show every year. 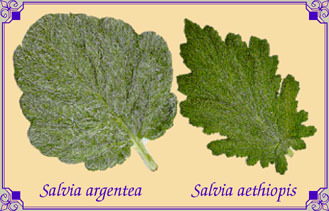 Salvia cacaliaefolia is the only member of section Standleyana; S. patens is one of five members of the closely related section Blakea, along with S. mendax, S. subpatens, S. vitifolia, and S. costaricensis. Besides the size of the flower, the main difference between the two sections is the size of the lower lip or palate. With S. cacaliaefolia, it is very small relative to the rest of the flower and quite the opposite with flowers of section Blakea. With all these species, foliage tends to be arrow-shaped (sagittate) or spear-shaped (hastate). S. patens has the smallest leaves of all these species. Most are sprawlers that outgrow competition (S. mendax and S. cacaliaefolia, for example). Most of the common varieties of S. patens are very similar to one another, differing mostly in flower color and lightly in leaf shape. The habits are all the same, and all form fairly thick rhizomes. The varieties include Oxford Blue (typical deep blue color), White Trophy (white), Chilcombe and Lavender Lady (lavender), and Cambridge Blue (light blue). All these are garden sports from material collected some time ago. A different form which has performed splendidly for me is `Guanajuato'. This one was collected fairly recently by Dr. James Compton and has double-sized flowers. During our relatively dry summer, the mother plant and even plants as young as six weeks bloomed almost continuously. It also withstood heat and humidity better, had a more open habit, and has shown no sign of going dormant. The leaves develop a brownish blotch in bright sun diring the summer. There are two sources of confusion on these sages. The first is the spelling of the synonym of S. misella (S. riparia) with that of a different species, S. rypara (section Malacophyllae). The second is that Dr. Ray Harley and J. R. I. Wood in 1989 combined S. riparia with S. misella (section Microsphace). Besides the similarity in name, both are small, bushy sages. S. rypara is distributed in a relatively small area in Argentina and Bolivia. The distribution of S. misella is much broader: Caribbean: Cuba; Jamaica, Haiti; Puerto Rico; much of Mexico; Guatemala; Honduras; Costa Rica; Venezuela; Columbia; Ecuador; Peru. The picture of S. misella in John Sutton's A Gardener's Guide to Salvias looks like my plant of S. rypara and not at all like the S. misella I recently got from Baton Rouge. The S. rypara I am growing has developed a large number of fine stems, whereas the new S. misella has a single large stem. When I get fully developed flowers, I will compare the structures of the stamens, especially of the connectives.